HYLE--International Journal for Philosophy of Chemistry, Vol. 22, No. 1 (2016), pp. 55-77. Abstract: Hardly any other artificially made medicine has ever had such a dangerous and unexpected potential as thalidomide. The medicine, which started its life as a harmless sleep-inducing substance, caused neurological and teratogenic damage, and, at the moment is a promising candidate for the fight against leprosy, cancer, and AIDS. The present study focuses on the early German history. It takes the bioactivity of that remedy as a chemical property and supports the claim that if a substance is biochemically active, adverse effects can hardly be avoided. The ethical role of an ontological underdetermination of chemicals is discussed, and an analysis of particular responsibilities is presented along the lines of modern principlism in biomedical ethics. Keywords: applied ethics, Contergan, thalidomide, chemical ontology, teratogenicity, chemical underdetermination. The Contergan disaster was possible because of the belief by laypersons and experts in the old myth of a remedy without any adverse effects, and the betrayal of that belief. Although the sleep-inducing sedative (or hypnotic) remedy Contergan – containing thalidomide as an active component – was officially launched by the company Grünenthal in Germany only in October 1957, the presumably very first victim of its adverse effects was born at Christmas of the preceding year. Ironically, this victim was the daughter of an employee of Grünenthal, who gave the substance to his pregnant wife, apparently off the record. Their baby girl was born without ears (Stephens & Brynner 2001, p. 19), but the causal relation between the administration of the substance and this situation was far from obvious at that time. Many more humans – estimations go up to about 10,000 – were born suffering from similar malformations and several other conditions. And many more than 10,000 – perhaps five times more – died before any physician could explain why. All this occurred around 1960, and the teratogen thalidomide was the substance that caused the catastrophe. The world was different after that substance had entered the scene. ‘What is a chemical substance?’ is a central question in the philosophy of chemistry, and it is just as central in ethics of chemistry, as well. This question is not sufficiently answered by pointing at the compositional or structural formula. All chemicals are long-term epistemic objects, meaning that the amount or realm of properties assigned to these substances can never be closed. Hence, a new substance always carries with it risks for living beings (Schummer 2001). Furthermore, regarding thalidomide, we have to take into account that it is not just one substance, but two (see Fig. 1). Figure 1 Structural formula of the (R)-(+) enantiomer of thalidomide. The hydrogen atom at the asymmetric carbon atom points up, and the phthalimide group down. In the (S) enantiomer it is inverse. This paper is divided into a narrative section and an ethical discourse section. According to its main purpose of introducing a pertinent case to chemists and chemistry students, the narrative shall focus on the main issues necessary for an ethical evaluation. As is appropriate in this specific case, the emphasis of study lies on the early (German) history up to about 1960. More elaborate exposures of the historical material and international aspects with partly different focuses can be found in the references, particularly in Sjöström & Nilsson 1972, Knightley 1979, Kirk 1999, Stephens & Brynner 2001, Zichner et al. 2005, and Lenhard-Schramm 2016. Although there exist some cases of remedies with adverse effects in the history of pharmacy as, for instance, the salts of heavy metals like lead and mercury (and the alloys of the latter) and, more recently, the case of Vioxx, the case discussed here is unique in at least the following respects: the pretended and offensively advertised harmlessness, the unexpected emergence of adverse effects (the malformational impact on new-borns and the damage to the neuronal system), the worldwide influence on the vigilance against drugs and drug safety regulations, and its huge catalytic effect on the development of neurology and teratology. Hence, thalidomide certainly ranks among the most influential man-made chemical substances of all time. Section 2 narrates the emergence of the substance including a critical synopsis of the central (but questionable) scientific paper of Grünenthal scientists, the substance distribution into society, the contact of the drug with human beings, its chemical (stereoisomeric) peculiarity, its temporary extinction and proscription, and, briefly, its rebirth as an active medicine. 2.1 How did the compound come into existence? Nevertheless, the paper was accepted and published, and the Grünenthal team came up with comparative results for six substances (Tab. 1), among them Doriden, the market competitor since 1955 (Fig. 2). According to the company’s goals, the most important conclusions from these data were the comparable efficacy of sleep-induction and the minimal toxicity. Table 1. Pharmacological/toxicological comparison of sleep-inducing drugs as inferred from the ‘jiggle-cage-method’ with mice (after Kunz et al. 1956, p. 428). * The actual value of the p.o.-LD50 for rats is 113 mg/kg. ** Note that the competitor Doriden from Ciba is the only other substance of the ‘piperidine-family’ used here (see Fig. 2). In the spring of 1955, clinical trials – the official testing of thalidomide on humans – began. No formal application was necessary at that time, and, moreover, no standard procedure for pharmacological trials had been developed yet. Although some side-effects were hinted at, all those reports concluded with similar positive judgments. Peripheral neuritis, in particular, was not described in detail as no thorough searches for side-effects had been conducted at the time, while the clinical studies used were far too short such that any long-term effects had insufficient time to develop. Thus, the severe adverse effects were found by epidemiological observations rather than in the clinical studies. Figure 2. Molecular formulas of Doriden, thalidomide, and barbituric acid (from the left). Note the similar structure of the CO-NH-CO-sections of these molecules (also referred to as imide) which is considered one main locus for interactions with biological targets. Note also that thalidomide has two of these sections. 2.1 How did thalidomide get into the public? Eventually, one year later, the management decided to apply for prescription requirement. However, the catastrophe could no longer be stopped. 2.3 How did it get banned? The course of the (temporary) decease of thalidomide as a remedy was different in other countries. Even before Grünenthal’s withdrawal of the drug, the Richardson-Merrell Company failed to get approval to register thalidomide (under the brand name ‘Kevadon’) for commercial use in the United States, whereas in Canada the registration was successful. Frances Kathleen Oldham Kelsey (1914-2015), a physician and pharmacologist with the U.S. Food and Drug Administration (FDA), found the submitted material imperfect and unsatisfactory. Her main criticism referred to the obvious differences of the animal test results on the one hand and the impact on humans on the other. Kelsey remained unshaken in spite of heavy contentions with the officials of the company, postponed the approval repeatedly, and the company finally gave up the proposal in March 1962. Hence, although thalidomide was not approved as a remedy in the USA, and therefore a disaster like in other countries did not emerge, even this country has experienced its pertinent cases as well. Whereas their chapter about thalidomide in the United States carries the heading ‘The results of vigilance’, the Swedish authors Sjöström and Nilsson (both of whom have been active in the trials mentioned below) call the chapter about their own country ‘The results of negligence’ (Sjöström & Nilsson 1972). In Sweden, as opposed to (Western) Germany, Neurosedyn and Noxodyn, both containing thalidomide, were prescriptive drugs right from the beginning. Like Grünenthal, the company Astra too was very reluctant to withdraw its products. Because the reports about the withdrawal by Grünenthal referred only to the German trade name Contergan, both physicians and potential consumers in Sweden were perplexed and did not recognize possible risks. The result was that more than 100 Swedish children suffered from phocomelia (in a small country with about 7.5 million inhabitants). In February 1962, a few concerned parents founded an association which finally went to court. Many international experts were invited. The issue ended in a settlement between the association for parents of malformed children and Astra. The compensation in Sweden (plus a few Danish cases) amounted to about 15 million USD. The purity of substances is a central and general topic in the history and philosophy of chemistry, but it becomes particularly intriguing in the instance of thalidomide, as it does for all stereo isomeric substances. Although all its molecules share the same compositional formula (and the same molecular spectra), the bulk material usually consists of two kinds of molecules which can be imagined like our two hands (see Fig. 1). The mixture of these enantiomers is called a racemate, and it is the latter that presumably was used in most experiments, particularly in those of the Grünenthal team, and presumably in the remedy, too. The biochemical reactivity, however, depends on the particular spatial organization of molecules; in most stereoisomeric pairs we find different effects for each enantiomer (Knabe 1995). Taking into account their general indifference about the real properties of their ‘wonder drug’, there is no wonder that the Grünenthal researchers did not say anything about this issue. However, after the manifestation of the negative effects of thalidomide several research teams began investigations in that direction, such that thalidomide became the classical drug containing a ‘bad’ and a ‘good’ part. I briefly refer to that issue here. In 1965, R- and S- isomers were prepared (Shealy et al. 1965), and two years later, biochemists from London published the surprising result that all three entities, R-, S-, and racemic thalidomide, show a teratogenic impact on the New Zealand White Rabbit. This species had recently been specified to be the only species to react equally sensitively to thalidomide as humans do (and it is still used as an ‘animal model’ in teratogenicity tests during the pre-clinical development of new active substances). Even more surprising than the teratogenicity of any thalidomide species in rabbits was that a very persistent myth emerged and flourished after Köhler et al. (1971) had published their study about teratogenic effects on mice. According to this myth, the R(+) enantiomer is considered the sleep-inducing but otherwise harmless (‘the good’) one, and the S(-) enantiomer the embryotoxic (‘the bad’) one. The results of this study, however, which must rely on at least one misinterpretation, have been falsified by Scott et al. (1977), who clearly confirmed the missing teratogenic impact of thalidomide in rodent species other than rabbits. One important pharmacokinetical principle was – and still is – omitted or neglected by the followers of the myth of good/bad thalidomide: the metabolization of active compounds. In aqueous systems like body liquids, thalidomide, although it is almost insoluble, can run through the well-known keto-enol tautomery, which is the dynamic joint between two different isomers. Only the keto-structure carries the asymmetry (Fig. 3). Figure 3. Structure of thalidomide in the ‘keto’ form (below). The position of the asymmetric carbon atom is labeled. The upper formula refers to the non-chiral ‘enol’ form. By equilibrizing the racemate is formed. The enantiomers cannot equilibrize directly. The two enantiomers are transformed into one another, meaning they racemize. The half-life of both R- and S- forms in a neutral phosphate buffer is about five hours. The racemization is accelerated if enzymatic (catalytic) effects like serum albumin are present. With albumin, half-times are reduced to 18.5 min (R), and 9.5 min (S), respectively (Knoche & Blaschke 1994). Thus, both enantiomers are transformed/metabolized into the respective other form in the body, resulting after some hours in a racemic mixture. The differentiation of activities, as the myth has it, in fact cannot be tested empirically at all because of the peculiar nature of thalidomide. 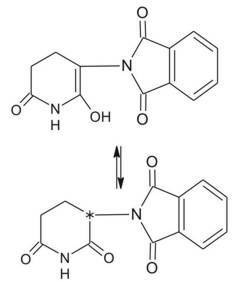 In addition to racemization, thalidomide is cleaved by hydrolytic reactions, such that it is still unknown which the active molecular agent is. Although it had a complicated and unclear beginning, was introduced to the public as a ‘wonder drug’, became a ‘dark remedy’, and has since been withdrawn as an active component, the epistemic and pharmaceutical object thalidomide is still vital and fashionable. At the moment, almost all of the manifest effects including the inhibition of angiogenesis or endocrine disruption are far from being understood, but – or better because of this – the research is booming. The direction of research, of course, is turning away from the sleeping pill to the fight against leprosy, AIDS, and cancer. One of the most astonishing comebacks of a ‘dead remedy’, the healing of leprosy by thalidomide, has been initialized – by chance: In 1964, Jacob Sheskin (1914-1999), the director of the Jerusalem hospital, gave the medicine, which had already been withdrawn, to a hopelessly ill patient in 1964. After the intended good sleep, the pain and the leprosy symptoms almost immediately vanished. Many other patients reacted similarly. This unexpected positive impact was obtained by a desperate (‘blind clinical’) move. But still, although there might be some desirable effects with a drug like thalidomide, there will always be a remaining danger, namely the unconscious digestion of the substance. In countries like Brazil, where leprosy threatens a large number of people, unintended increases in the use of the substance has led to new cases of malformations. Therefore, as long as the substance is available to the public or parts of it, for whatever reason, vigilance must not be neglected (but this is already a point that belongs in the following section). In fact, science survived these greed-driven distortions, lies, and slackness, and made significant progress, but many thousands of humans could not do so, and some thousands have suffered unnecessarily. Apparently, the transition from miserable science to ‘fraud and deceit in science’ is much easier than we would wish, and this has a reasonable influence on the ethical judgment, as we will see below. 3.1 Could the disaster have been avoided? To start the discussion of pertinent ethical issues, that is to find out the neuralgic points of responsibilities, I shall explore some possible answers to the question used as the heading of this section. A first, admittedly quite simplistic answer would be: yes, if nobody had synthesized the substance, and if nobody had distributed it, and if nobody had needed and consumed these sleeping-pills during the first trimester of pregnancy, the surprising and threatening chemical behavior would not have been realized – at least not in the terrible way it was. A safety-oriented and less trivial positive answer could be motivated by the evidence of neurological impairments, the reports of which commenced in 1959. This less trivial ‘yes’ could be applied if physicians and scientists, particularly those of Grünenthal, had been much more attentive and careful than they were. The story of the non-licensing of thalidomide to Richardson-Merell in the USA due to the resistance of the FDA physician Frances Kelsey (who in 1962 was honored by President Kennedy) refers to that version to argue for a ‘yes’. Of course, Kelsey could not and did not know that thalidomide would turn out to be a teratogen, thus that part of the rejection of the application by the FDA was a lucky outcome. Still, the officials of Grünenthal did a less than mediocre job as scientists and physicians by dropping their scientific curiosity and veracity with respect to their own product. While neglecting the underdetermined chemical character of their product, they decided to follow or tolerate an aggressive marketing campaign based on at least incomplete and distorted results and trivialized or neglected all the anxious reports about side effects. Another simple but naively whiggish justification of a ‘yes’ to the question in the heading of this section would be connected to the performance of teratogenicity tests. The problem is: nobody asked for such tests at that time – not the governmental legislators or regulators, and in particular not the manufacturers – and, furthermore, nobody would have known which experiments to perform or which kind of animal to take. As described above, Blasiu and particularly Nulsen came the closest to the pertinent knowledge, however by dubious methodologies. The missing-question-argument is supported by the switch-on-effect of the number of publications after 1961 (for a few German journals, see Fig. 4): Even the otherwise attentive scientific community did not suspect anything like this, and a worldwide investigation campaign with hundreds of papers was started only after the manifestation of the effect by people like Lenz. Finally, then, the answer to the question above must be ‘no’, if someone would refer to the mentioned myth of the ‘evil’ and the ‘good’ thalidomide (‘distomer’ vs. ‘eutomer’): there is – unfortunately, perhaps – no practical way to differentiate those two biochemically. Figure 4. Numbers of articles on thalidomide in three German pharmaceutical journals (Deutsche Apotheker Zeitung, Pharmazeutische Zeitung, Arzneimittelforschung) during the main historical phase (after Kirk 1999). Typically, non-knowledge outmatches knowledge with respect to new chemical entities, which is a good reason to be careful in whatever application. Hence, the very issue of underdetermination – the knowledge about predominant non-knowledge in chemistry – distinguishes the Contergan case principally from other accidents as, for instance, the Titanic disaster. The only feasible way to eliminate risk would be to stop producing and distributing new substances. 3.3 Who takes responsibility for what? Respect for autonomy: The medical expert or healthcare professional should respect the decision-making capacities and wishes of the patient. He or she should actively support the enabling of individuals to make informed choices. The informed consent is perhaps the most important expression for this respect of autonomy. Non maleficence: The medical expert or healthcare professional must avoid causing harm. Because all treatments include risks this principle conflicts with (iii). Beneficence: This considers the balancing of benefits of treatment against the risks and costs; the healthcare professional should act in a way that benefits the patient/consumer. It is necessary to actively support the benefits for the patient/consumer. I have shown above that informed consent has been violated severely in the Contergan case. The groups of creators (chemists, pharmacists), testers (pharmacologists, physicians), and distributors (traders, apothecaries, physicians) have misused their customers (consumers and their babies) as guinea pigs or ‘canary birds in the mine of our future’ in blind, uninformed clinical trials outside the clinics. Indeed, when it is not known whether a substance being produced is harmful, then the testers and distributors bear the highest amount of responsibility. Later, the producers carry responsibility, too. The legislators must implement and monitor the drug safety framework, which was, as we have seen, quite miserable in most countries during the 1950s, although these vary in detail. I have to stress here that Frances Kelsey was one of the few persons working in administration who took the regulating principles serious, particularly principle (ii), and was very successful with that. As to the threat for babies, the situation is different. Babies cannot be recipients of any information, therefore principle (i) becomes a respect for future autonomy, and with respect to that, the mother changes into the role of a responsible actor. Up to this point I have focused on the role of the creators and distributors of thalidomide and their responsibilities. To gain a more adequate and all-encompassing picture for the ethical discourse, however, it seems necessary to analyze the consumers, too. Between 1957 and 1961, about 5 million people took 300 million daily doses (100 mg). In most of the scientific and public discussions, new-borns, stillborns, and mothers are solely presented as victims without freedom of action. Of course, for the children this is correct, but is it correct for the mothers, too? Is it necessary to take sleeping pills on a regular basis, perhaps over the whole period of pregnancy? Pregnant consumers take responsibility for the health and welfare of their offspring, independent of the ethical conviction or belief (see principles (ii) and (iii)). There are good arguments not to consider insomnia and nausea as illnesses during the first trimester of pregnancy, and if both are not illnesses, then no medication is needed at all. After all, in present-day pregnancy pharmacotherapy, sleep-inducing drugs are no longer used, and thalidomide (and its relatives) is prescribed only for very particular indications (for example, leprosy, cancer, AIDS) and with detailed safety instructions (Schaefer & Weber-Schoendorfer 2009). Frequently, the general advice is not to prescribe or take new and premature drugs (which is in accordance with the lessons we learned from the Contergan disaster). Hence, we should not forget to take into account the role and responsibility of the drug consumers. Referring to principles (ii) and (iii): To do no harm to the patient/consumer is an old principle of the medical ethos (primum nil nocere), and to do good seems to be almost trivial as a medical principle. Nevertheless, with the present case it is useful to recognize that the former has to do with omitting, the latter with active doing. Ironically, the handling of thalidomide turned those principles upside-down: What was omitted and disregarded by the testers and distributors was particularly principle (ii), and the benefits of some enforced sleep (plus the financial benefits of the companies) could by no means compensate for the malformations of new-borns and stillborns. The interpretation of the principle of doing justice (iv) goes into a similar direction as the points proposed above. Benefits and risks were not distributed fairly. Another important field of ethical dispute addressing pharmacology and toxicology in general and the Contergan case in particular is the field of animal ethics, which I mention here only briefly. After 1961, many countries tightened their regulations regarding the approval of remedies. In the European Community, for example, full toxicology studies, including teratogenicity tests, have had to be conducted on at least two species of mammals since 1975. These species are specified, referring to the teratogenicity tests, as rabbits on the one hand (of a race that is ‘sensitive against a proven embryotoxic substance’) and rats or mice on the other. Without doubt, this specification is the result of the Contergan case. But who can know in advance whether or not any teratogen reacts like thalidomide? And who can be sure that the chosen animals are of the right species for any risk impact – imaginable or not? The answer to both questions is simple: no one. We still do not know enough about the molecular mechanisms, and it is still possible for a substance to pass the now ‘tightened’ toxicological controls, and nevertheless cause harm on a different path than expected. What certainly has been tightened is the precarious situation of test animals, which have been sacrificed in significantly increasing numbers since Contergan. The main legitimization for this procedure is the fact that there was no comparable case ever since (but this might lead to a typical induction fallacy). Hence, aside from the general use and consumption of animals as substance testers, the Angst-driven decisions of the legislators and regulators around the world are questionable in both methodological and ethical perspectives. (1) According to Joachim Schummer, those who create and prepare substances carry responsibility for the impact of these substances, and should be aware of providing morally relevant arguments which can support their actions (Schummer 2001, p. 111). Particularly if adverse effects have become known in the case of a remedy, further production becomes questionable from an ethical point of view. In the present context, however, it is not easy to identify and address the very chemist or chemists who prepared the substance for the first time. Along with other disinformational statements, the officials of Grünenthal have not provided trustworthy references about the possible prehistory and the early history of this bioactive substance until the present day. What we have are good arguments that the embryopathic property is not the only pharmaco- and toxicodynamical difference between humans and (most) rodents. Indeed, the question – which is of ethical interest as well – remains: Where did the information about the sleep-inducing impact on humans come from? (2) As with other pertinent issues of applied ethics – see for example the discourse on active and passive euthanasia – the thalidomide story is foremost about doing and omitting: The main omission of the leaders of Grünenthal – one that is morally inexcusable – has been the continued lack of reports on side effects (as well as other alarming information resulting from the company’s studies). Their equally morally wrong action was the misrepresentation of the facts to the scientific community, physician, and the public. Their behavior described in the present paper was without doubt a scandal. (3) The embryotoxic effect was a new and unpredictable chemical property of thalidomide; this part of the story was a real accident and no fault (like, for example, the catalytic depletion of stratospheric ozone by fluorochlorohydrocarbons). The characterization of a (new) substance is never finished and sometimes mercurial (cf. DDT, cholesterol, laughing gas, fluorochlorohydrocarbons, and many others). (4) The dream of an entirely harmless but fully effective remedy should never be dreamt again. To paraphrase the old wisdom of Paracelsus: If it is active, then it has side-effects, too. (5) There has rarely been an artificial substance that came so close to humans with such dangerous, unexpected, and at the same time promising potential as thalidomide. However, it is not the substance that should be blamed, but those humans who do things by halves. I shall finish by briefly addressing an issue not yet referred to in the present study, and seldom elsewhere in the body of work dealing with thalidomide. That final issue touches on a different aspect of ethical discourse. It is quite common for many institutions and for the public to project disaster or catastrophe on those humans born with the described symptoms, and these humans are considered to be ‘Sorgenkinder’ (problem children). But does it go without saying that all thalidomiders lead a miserable life and that they suffer on a daily basis? There are several autobiographical accounts, most of which impressively show that this is not the case (Eistel 2007). Bettina Eistel, to mention only one of these thalidomiders, studied psychology, is a very successful dressage equestrienne with medals from European championships and the Paralympics, and is a well-known television moderator. There is much happiness here and creative power, and there is no need to reduce the lives of these persons to their disabilities. Hence, if there is a problem, it might as well be one of the societal environment rather than that of the thalidomiders themselves. I thank Joachim Schummer for the help in getting this project started and hints to early versions of the text. Two referees also helped to get the manuscript into shape. For discussions of early historical aspects, I am grateful to Christoph Friedrich and, in particular, Nils Kessel. I am indebted to Christian Gasde, who helped to get the paper grounded, and to Barney Craven, who amended errors and bloomers and did a lot to bring the text into a readable version. Remaining weaknesses, errors, misrepresentations, and misinterpretations are mine, of course. The motto is taken from an advertisement of the German remedies Contergan and Contergan forte by the company Grünenthal, reproduced in Kirk 1999, p. 267, my translation. ‘Panta rhei’ means ‘all is in flux’, which is ascribed to the Presocratic philosopher Heraclitus. ‘Thalidomide’ is an artificial name, derived from the older abbreviated name α-Phthalimidoglutarimide; IUPAC calls it 2-(2,6-dioxo-3-piperidyl)isoindoline-1,3-dione. The Chemical Abstract System (CAS) number is 50-35-1. Though usually very rare (Pschyrembel 1986, p. 389), phocomelic malformations of new-borns have not been excluded from public knowledge, see the ‘black painting’ named ‘Mother showing her deformed child to two women’ by Goya (reproduced, for example, in Hoffmann 1995, p. 133, and in Roth 2005, p. 212). The most typical of these malformations of legs and arms are subsumed under ‘phocomelia’, which refers to the flippers of seals; the more general medical term for malformations of extremities, however, is ‘dysmelia’. There are several other aspects of the impact of thalidomide on new-borns. Teratology is the science of the phenomena, causation, and mechanisms of morphological and functional developmental disorders in animate beings, see Mutschler & Lemmer 1985. Teratogenicity, carcinogenicity, and mutagenicity are the three main classes of chronic toxicity, contrasting with acute toxicity. Sjöström & Nilsson 1972 is the most original of the thalidomide monographs, that is, all later publications refer to or are based upon the latter. Both authors were involved in the Astra case in Sweden, thus the book is slanted to a certain degree (and it lacks an index). Knightley 1979 is a brilliantly written must-read with an index, and a very informative appendix on the chemistry of thalidomide (information which is almost entirely missing in the other books mentioned here). Kirk 1999 is a doctoral thesis in the history of pharmacy from the University Greifswald, Germany. It commendably meets the requirements for written scientific work, particularly neutrality, although an index is missing. Stephens & Brynner 2001 has a very useful index, but is not throughout reliable referring to details, and perhaps too speculative in some spots. Zichner et al. 2005 does not present material that goes beyond that of the earlier works, particularly that of Kirk. It has its strength in a more sociological and ethical scope, and the integration of orthopaedic aspects (which I do not refer to here). The historical dissertation of Niklas Lenhard-Schramm (2016) is an easy accessible, fresh and substantial documentary, highly recommendable for German speaking readers. Cf., for example, Schneider 1985, Talbot & Waller 2004. Apart from Contergan, Grünenthal had an intriguing history of pharmacological failures of its own (cf. Sjöström & Nilsson 1972). As to Vioxx, see Rourke 2006 and the references therein. ‘Initial excitation phase’ means the higher activity of the animals directly after administration, an effect well-known, for example, for barbiturates (presumably ‘+++’ means very high and ‘–’ none). Initially, the following four studies sponsored by Grünenthal have been published in scientific journals: Esser & Heinzler 1956, Jung 1956, Stärk 1956, and Walkenhorst 1957. Later, a study on nursing (not pregnant) women followed (Blasiu 1958). None of these went deeper into metabolism and pharmacokinetics. Among the first to become aware of possible neuronal damage caused by thalidomide was the physician Ralf Voss from Düsseldorf. As early as 1959 he contacted the Grünenthal officials, but they dismissed the warning. (See the chapter with the telling title ‘How to Sell a Wonder Drug’ in Knightley 1979.) Later, he published his observations (Voss 1961). See, for example, Lenz 1961, Lenz & Knapp 1962, and, also from Lenz’s working group, Nowack 1965. By ‘blind’ clinical study I here mean the administration of a presumably active substance to humans without their notice or information and before safety has been established. Widukind Lenz and his group found out that the first trimester of pregnancy is the most critical phase for the impact of thalidomide. For the thalidomide story in the USA, see Sjöström & Nilsson 1972, pp. 112-130; Knightley 1979, pp. 64-86; Stephens & Brynner 2001, pp. 39-59; and Kirk 1999, pp. 191-205. An informative account of that aspect can be found in Roth 2005. Whereas pharmacodynamics investigates the impact of incoming substances (‘What does the stuff do to the body?’), pharmacokinetics examines what becomes of the incoming substances (‘What does the body do to the stuff?’). For a full understanding of the nature of a substance (including adjunct ethical issues) in the biomedical field, it is necessary to take into account both aspects. Stephens et al. (2000) give a more recent commentary on the embryopathy explanation hypotheses. Raza 2002 argues for the strict non-use of thalidomide because of the possible misuse. At the same spot, however, Hoffmann hints at teratological tests that where performed in the 1950s, but does not refer to the uneasy way to find an adequate ‘animal model’. ‘Fraud and Deceit in Science’ is the subtitle of Betrayers of the Truth (Broad & Wade 1982). In this book, the authors present a list of known or suspected cases of scientific fraud. I have shown here that it would be possible to consider the original thalidomide ‘research’ as a candidate for that list. Using mainly the files of the Alsdorf trial, Beate Kirk gives a meticulously penetrating account of that part of the story in 1960-1961, which in fact is an almost classical sociopathological tragedy about practical constraints (Sachzwänge) in professional life (Kirk 1999, pp. 60-86). She apparently tends to this interpretation; intriguingly, the results of a study initiated and accepted by Grünenthal in 1957 gave an obvious account of the neurological activity of Contergan – as stimulant (!) for electroencephalograms (Walkenhorst 1957). For detailed accounts of this story see the previously mentioned references. In the German Democratic Republic, thalidomide was not licensed because there were already enough hypnotic remedies, rather than for safety or ethical reasons. Note that the German edition of Sjöström & Nilsson 1972 was published in the GDR. The foreword by the Berlin pharmacologist F. Jung is a practically undisguised piece of propaganda. Maio 2005 points out that while it can be immoral not to test medicines on humans sufficiently, it can be immoral to test them on certain groups of humans (here: pregnant women). See, for example, the accounts of that expression in the introductory textbooks Ladyman 2002, French 2007 and Wiltsche 2013. The customary understanding of underdetermination is the lack of data supporting a certain theory. Annas & Elias (1999) compare these two cases. Referring to the re-introduction of the drug in the USA, they say (p. 100): "Like preventing death at sea, preventing thalidomide-affected births will require not only medical technology but also human alertness." In a broader sense, a similar canary-bird-metaphor is used by Murphy & Goldkind 2005. For a short discussion of that point see Nesse 2012, p. 175. Note that this principle is explicitly used as an accusing claim against the manufacturers by Voss 1961. We should reformulate principle (ii) as follows: Leave the patient alone if he or she is well! See Hasskarl & Kleinsorge 1979, pp. 206-208. In Germany the ‘Aktion Sorgenkind’ (‘Initiative Problem Child’) was a fundraising campaign involving a television show and a lottery that was initially motived by the Contergan story. It was first introduced in 1964, and over the years about 1 billion euros have been collected to support the disabled. In part due to this initiative, many negative stereotypes about disabilities and personal differences have strongly and verifiably changed in Germany. Intriguingly, the name of the project was changed to ‘Aktion Mensch’ (‘Intitiative Human’) in the 1990s. Annas, G.J. & Elias, S.: 1999, ‘Thalidomide and the Titanic: Reconstructing the Technology Tragedies of the Twentieth Century’, American Journal of Public Health, 89, 98-101. Beauchamp, T.L. & Childress, J.F. : 2009, Principles of Biomedical Ethics, New York/Oxford: Oxford University Press. Blasiu, A.: 1958, ‘Erfahrungen mit Contergan in der Frauenheilkunde’, Medizinische Klinik, 53 (18), 800. Broad, W. & Wade, N.: 1982, Betrayers of the Truth: Fraud and Deceit in Science, Oxford: Oxford University Press. Eistel, B.: 2007, Das ganze Leben umarmen, Bergisch Gladbach: Ehrenwirth. Esser, H. & Heinzler, F.: 1956, ‘Klinische Erfahrungen mit einem neuen Sedativum und Hypnoticum’, Therapie der Gegenwart, Monatsschrift für praktische Medizin, 95 (10), 374-376. French, S.: 2007, Science: Key Concepts in Philosophy, London/New York: Continuum. Friedrich, C.: 2005, ‘Contergan – zur Geschichte einer Arzneimittelkatastrophe’, in: L. Zichner, M.A. Rauschmann, K.-D. Thomann (eds. ), Die Contergankatastrophe, Darmstadt: Steinkopff, pp. 3-12. Hasskarl, H. & Kleinsorge, H. (eds. ): 1979, Arzneimittelprüfung und Arzneimittelrecht, 2nd ed., Stuttgart-New York: G. Fischer. Jung, H.: 1956, ‘Klinische Erfahrungen mit einem neuen Sedativum’, Arzneimittel-Forschung, 6, 430-432. Kessel, N.: 2013, ‘Doriden von Ciba: sleeping pills, pharmaceutical marketing, and Thalidomide, 1955-1963’, History and Technology, 29, 153-168. Kirk, B.: 1999, Der Contergan-Fall: eine unvermeidbare Arzneimittelkatastrophe? Zur Geschichte des Arzneistoffs Thalidomid, Stuttgart: Wissenschaftliche Verlagsgesellschaft. Knabe, J.: 1995, ‘Synthetische Enantiomere als Arzneistoffe’, Pharmazie in unserer Zeit, 24, 324-330. Knightley, P.: 1979, ‘Suffer the Children – The Story of Thalidomide’, London: A. Deutsch. Knoche, B. & Blaschke, G.: 1994, ‘Investigations on the in vitro racemization of thalidomide by high-performance liquid chromatography’, Journal of Chromatography A, 666, 235-240. Köhler, F., Meise, W. & Ockenfels, H.: 1971, ‘Teratologische Prüfung einiger Thalidomid-Metabolite’, Experientia, 27, 1149-1150. Kunz, W.: 1959: ‘Eine Übersicht der neueren Arzneimittel aus den letzten fünf Jahren’, in: E. Jucker (ed. ), Fortschritte der Arzneimittelforschung, Basel & Stuttgart: Birkhäuser, vol. 1, pp. 531-607. Kunz, W., Keller, H. & Mückter, H.: 1956, ‘N-Phthalyl-glutaminsäure-imid: Experimentelle Untersuchungen an einem neuen synthetischen Produkt mit sedativen Eigenschaften’, Arzneimittel-Forschung, 6, 426-430. Ladyman, J.: 2002, Understanding Philosophy of Science, London & New York: Routledge. Lenhart-Schramm, N.: 2016, Die Haltung des Landes Nordrhein-Westfalen zu Contergan und den Folgen, Ph.D. dissertation, University of Münster. Lenz, W.: 1961, ‘Kindliche Mißbildungen nach Medikamenteinnahme während der Gravidität’, Deutsche Medizinische Wochenschrift, 86, 2555-2556. Lenz, W. & Knapp, K., 1962, ‘Foetal Malformations Due to Thalidomide’, German Medical Monthly, 7, 253-258. Maio, G.: 2005, ‘Ethische Überlegungen zur Contergankatastrophe und zur Wiedereinführung von Thalidomid’, in: L. Zichner, M.A. Rauschmann, K.-D. Thomann (eds. ), Die Contergankatastrophe, Darmstadt: Steinkopff, pp. 129-134. McBride, W.G. : 1961: ‘Thalidomide and Congenital Abnormalities (letter to the editor)’, The Lancet, 2, 1358. McBride, W. G.: 1977, ‘Thalidomide embryopathy’, Teratology, 16, 79-82. Muller, G.W. ; Konnecke, W.E. ; Smith, A.M. & Kethani, V.D. : 1999, ‘A Concise Two-Step Synthesis of Thalidomide’, Organic Process Research& Development, 3, 139-140. Murphy, D. & Goldkind, S.F. : 2005, ‘The Regulatory and Ethical Challenges of Pediatric Research’, in: M.A. Santoro & T.M. Gorrie (eds. ): 2005, Ethics and the Pharmaceutical Industry, Cambridge: Cambridge University Press, pp. 48-67. Mutschler, E. & Lemmer, B. (eds. ): 1985, Pharmakologie: Medizinische Grundbegriffe, Stuttgart: Wissenschaftliche Verlagsgesellschaft. Nesse, R.: 2012, ‘Warum es so schwer ist, Krankheit zu definieren: Eine darwinistische Perspektive’, in: Th. Schramme (ed.) Krankheitstheorien, Berlin: Suhrkamp, pp. 159-187. Nowack, E.: 1965, ‘Die sensible Phase bei der Thalidomid-Embryopathie’, Humangenetik, 1, 516-536. Nulsen, R.O. : 1961, ‘Trial of thalidomide in insomnia associated with the third trimester’, American journal of obstetrics and gynecology, 81, 1245-1248. Pschyrembel: 1986, Klinisches Wörterbuch, Berlin/New York: de Gruyter. Raza, A.: 2002, ‘The third coming – Thalidomide and a final goodbye’, The Biochemist, February, 21-23. Roth, K.: 2005, ‘Eine unendliche chemische Geschichte’, Chemie in unserer Zeit, 39, 212-217. Rourke, J.S.IV., 2006, ‘Merck & Co. Inc.: Communication Lessons from the Withdrawal of Vioxx’, Journal of Business Strategy, 27, 11-22. Santoro, M.A. & Gorrie, T.M. (eds. ): 2005, Ethics and the Pharmaceutical Industry, Cambridge: Cambridge University Press. Schaefer, C. & Weber-Schoendorfer, C.: 2009, ‘Pharmakotherapie in der Schwangerschaft’, Internist, 50, 455-466. Schneider, W.: 1985, Geschichte der Pharmazie, Stuttgart: Wissenschaftliche Verlagsgesellschaft. Schummer, J. : 2001, ‘Ethics of Chemical Synthesis’, Hyle – International Journal for Philosophy of Chemistry, 7, 103-124. Shealy, Y.F. ; Opliger, C.E. & Montgomery, J.A. : 1965, ‘D-and L-thalidomide’, Chemistry & Industry, 24, 1030-1031. Scott, W.J. ; Fradkin, R. & Wilson, J.G. : 1977, ‘Non-Confirmation of Thalidomide Induced Teratogenesis in rats and Mice’, Teratology, 16, 333-335. Sjöström, H. & Nilsson, R.: 1972, Thalidomide and the Power of the Drug Companies, Middlesex: Penguin (German translation as: Contergan oder die Macht der Arzneimittelkonzerne, VEB Verlag Volk und Gesundheit, Berlin, 1975). Stärk, G., 1956, ‘Klinische Erfahrungen mit dem Sedativum K 17 in der Lungenheilstätte und der allgemeinen Praxis’, Praxis – Schweizerische Rundschau für Medizin, 45 (42), 966-968. Stephens, T.; Bunde, C.J.W. & Fillmore, B.J. : 2000, ‘Mechanism of Action in Thalidomide Teratogenesis’, Biochemical Pharmacology, 59, 1489-1499. Stephens, T. & Brynner, R.: 2001, Dark Remedy, Cambridge: Perseus. Talbot, J. & Waller, P. (eds. ): 2004, Stephens Detection of New Adverse Drug Reactions, 5th ed., Chichester: Wiley. Voss, R.: 1961, ‘Nil nocere! Contergan-Polyneuritis’, Münchener Medizinische Wochenschrift, 103 (30), 1431-1432. Walkenhorst, A.: 1957, ‘Das hypnotisch und sedativ wirkende N-Phthalyl-Glutaminsäure-Imid als geeignetes Provokationsmittel bei hirnelektrischen Untersuchungen’, Wiener klinische Wochenschrift, 69, 334-339. Wiesing, U. (ed. ): 2012, Ethik in der Medizin – Ein Studienbuch, Stuttgart: Reclam. Wiltsche, H.A. : 2013, Einführung in die Wissenschaftstheorie, Göttingen: Vandenhoeck & Ruprecht. Zichner, L.; Rauschmann, M.A. & Thomann, K.-D. (eds. ): 2005, Die Contergankatastrophe – Eine Bilanz nach 40 Jahren, Darmstadt: Steinkopff.